The final season of the 'Game of Thrones' will soon debut and the premiere took place this evening(April 3rd) at Radio City Music Hall in New York. 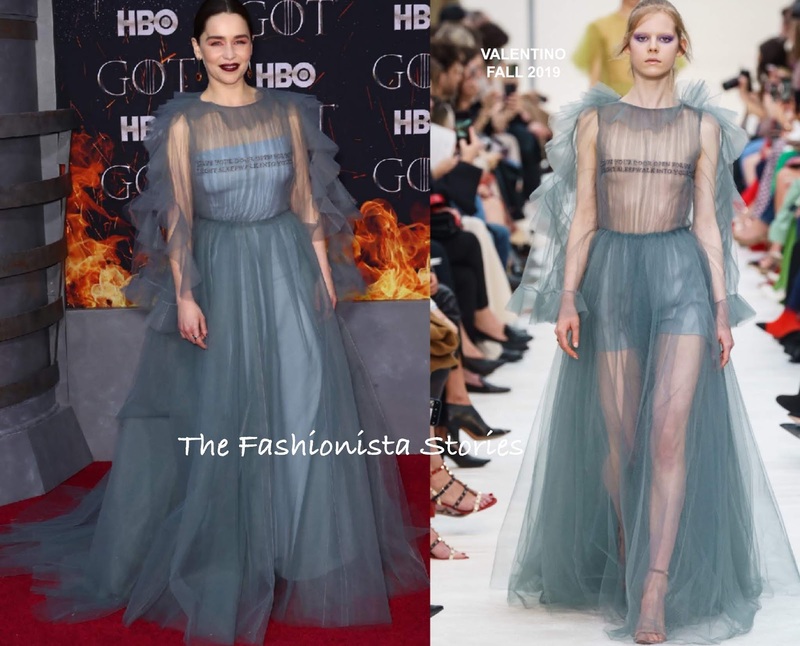 Emilia Clarke wore a semi-sheer tulle gown from the VALENTINO FALL 2019 collection. The gown was unlined on the runway but the addition of the lining for Emilia, worked. However it's the make-up that I find confusing. The vampy look is most likely an ode to the show but she should have either gone with the eyes or the lips. The heavy eyes & lips don't work together. 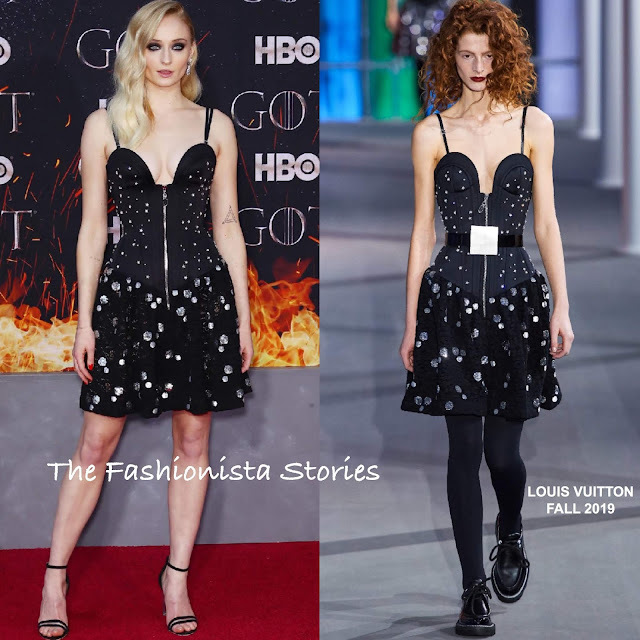 Sophie Turner was in head to toe LOUIS VUITTON, which featured a FALL 2019 black textured, star embellished dress and black sandals. On the runway, the dress was adorned with a belt, which she ditched. The dress works with & without the belt. However I think she may have gone to heavy on the eyes. 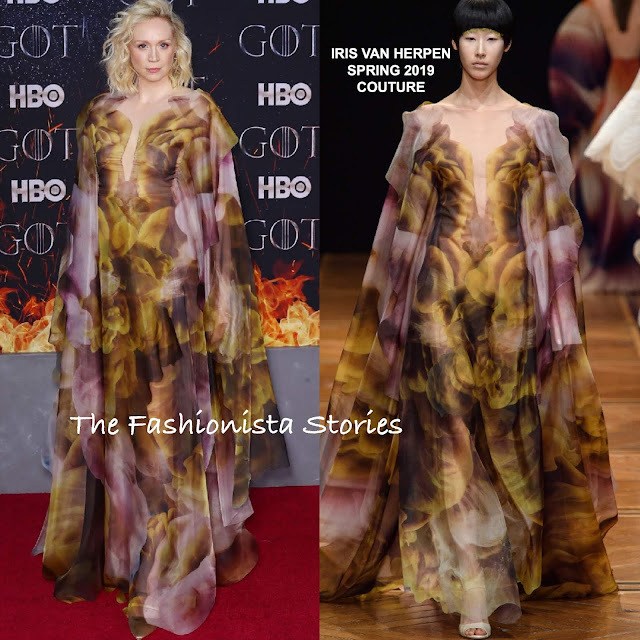 Gwendoline Christie was my favorite here because she totally nailed this printed cape gown from the IRIS VAN HERPEN SPRING 2019 COLLECTION. However I wish the hair was sleeker. 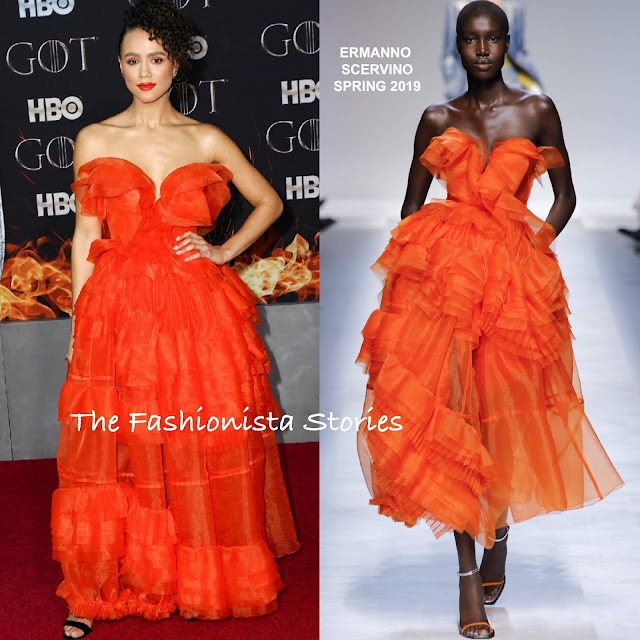 Nathalie Emmanuel could not missed wearing this vibrant red-orange ERMANNO SCERVINO SPRING 2019 ruffle strapless tulle dress. Love the dress but I actually prefer the length on the model. Also I wish she added a necklace and kept the runway's sandals. 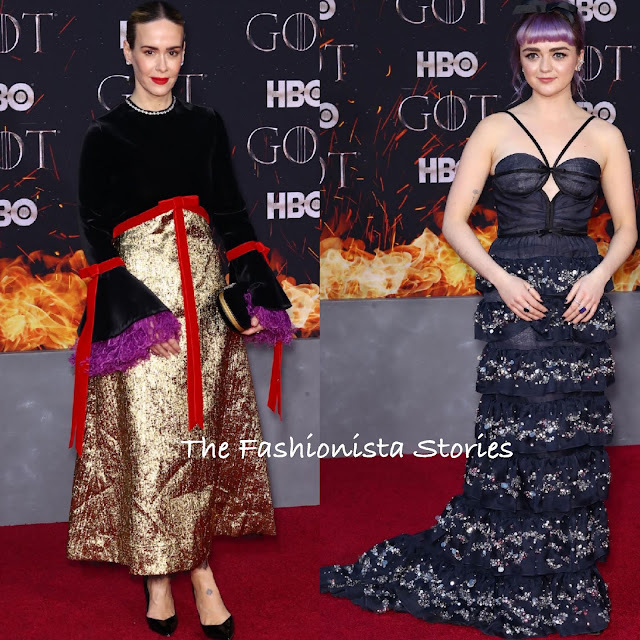 Sarah Paulson opted for a GUCCI black velvet & gold metallic ankle length dress, which featured contrasting red velvet bow panels, bell sleeves with contrasting purple ruffle lace underlay. The dress is right up Sarah's style alley but it is not flattering on her, especially in the mid-section. NORMAN SILVERMAN jewelry, a GUCCI clutch and STELLA LUNA pumps rounded out her look. Maisie Williams wore a navy ruffle, tier embellished gown by MIU MIU. The top is not working for me but I do like the skirt. FLAVIA jewelry finished up her look. Jessica Williams turned to Russian fashion house ALENA AKHMADULLINA, wearing a RESORT 2019 color-block sequin & paillettes midi dress, featuring a sheer illusion yoke and a unicorn appliqué. I like the dress for Jessica but I find the dark lip to be too heavy for the tone of the dress. Also I would swap out the pumps for a simple metallic sandals. I am on board with the clutch and curls though. Lisa Bonet chose a look from the once popular CHRISTIAN DIOR RESORT 2018 collection. 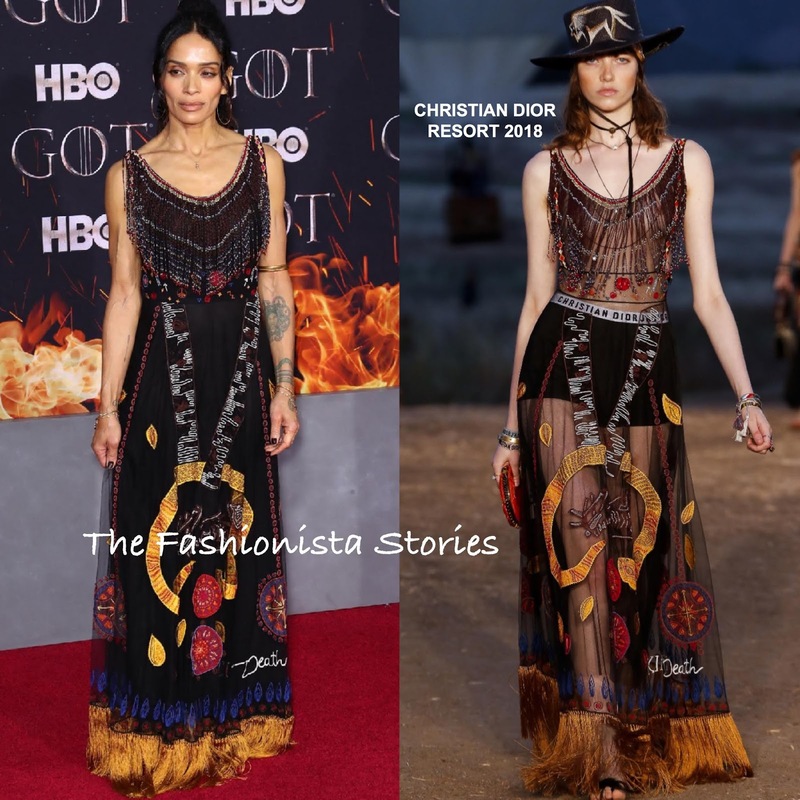 Her printed beaded & fringe hem gown was unlined on the runway but Lisa lined her gown which worked in her favor. Her boho inspired look was topped off with gold jewelry. Natalie Dormer was definitely owning her GIORGIO ARMANI FALL 2019 black semi-sheer velvet beaded & silk gown. A touch of color came via her colored smokey eyes which topped off her look along with off-the-shoulder tresses and statement earrings. 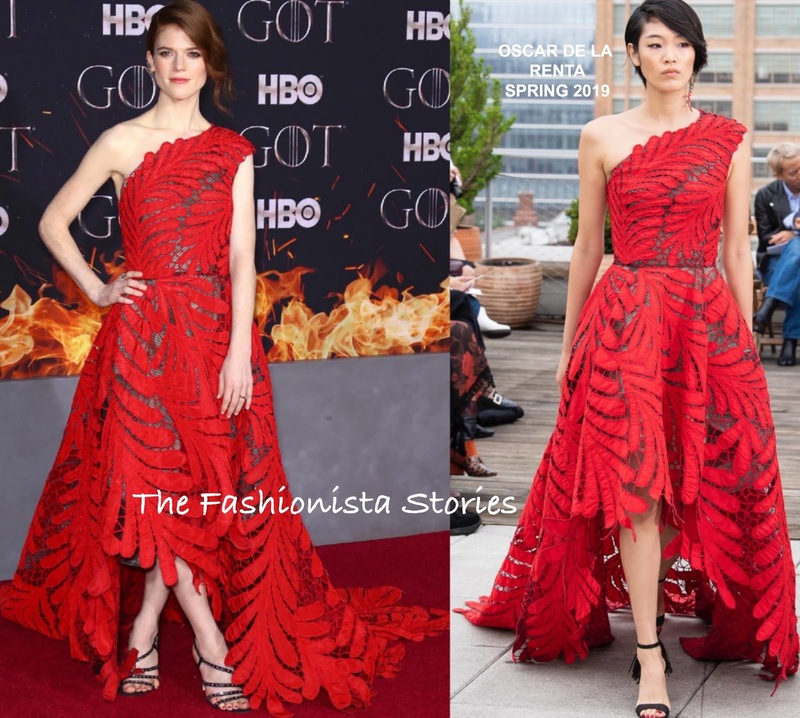 Rose Leslie was elegantly beautiful wearing a OSCAR DE LA RENTA SPRING 2019 one-shoulder high-low gown. Her was done in a leaf-pattern & silk guipure lace with tonal bead embroidery tracing edges. She finished up with FRED LEIGHTON jewelry, SERGIO ROSSI sandals and a complimentary beauty look. Amanda Peet wore a lavender floral print, silk gown from the CAROLINA HERRERA FALL 2019 collection. While the gown was un-lined on the runway, Amanda lined hers for the premiere and it worked. I just wish the hair was completely off-the-shoulders.